A peaceful 2 bedroom side apartment with full kitchen and laundry facilities and an outlook to the dunal foreshore and boardwalk. Apartment has balcony facing the north for a warm and restful stay without roads between you and the Beach. Queen bed in the Master bedroom with Ensuite. 2nd Bedroom has 2 single beds. The 2nd bathroom has toilet shower and vanity. The lounge has DVD player, TV and FOXTEL. Full kitchen with dishwasher, oven, stove, crockery, cutlery. All linen is supplied. Absolute beachfront - no roads to cross. This peaceful 2 bedroom apartment has full kitchen with dishwasher, oven, stove, crockery, cutlery and laundry facilities and an outlook to the dunal foreshore and boardwalk. Apartment has balcony facing the north for a warm and restful stay without roads between you and the Beach. Queen bed in the Master bedroom with Ensuite. 2nd Bedroom has 2 single beds. The 2nd bathroom has toilet shower and vanity. The lounge has Air- conditioning, DVD player, TV and FOXTEL. All linen is supplied. A peaceful 2 bedroom centre apartment with air conditioning, full kitchen, laundry facilities and an outlook to the dunal foreshore and boardwalk. Apartment has full view windows (glassed in balcony) for a warm and restful stay without roads between you and the Beach. Queen bed in the Master bedroom with Ensuite. 2nd Bedroom has 2 single beds. The 2nd bathroom has toilet shower and vanity. The lounge has air conditioning, DVD player, TV and FOXTEL. Full kitchen with dishwasher, oven, stove, crockery, cutlery. All linen is supplied. A peaceful 2 bedroom side apartment with full kitchen and laundry facilities and an outlook with partial sea views. Apartment has balcony facing the north for a warm and restful stay without roads between you and the Beach. Queen bed in the Master bedroom with Ensuite & wall mounted TV. 2nd Bedroom has bunk beds. The 2nd bathroom has toilet shower and vanity. The lounge has wine fridge, DVD player, TV and FOXTEL. Full kitchen with drawer type dishwasher, oven, stove, crockery, cutlery. All linen is supplied. A 3 Bedroom Apartment in La Mer next to 84. A peaceful 3 bedroom apartment with views of the dunal foreshore with full kitchen and laundry facilities and secure parking. Apartment facing the north for a warm and restful stay without roads between you and the Beach. Queen bed in the Master bedroom with Ensuite and walk-in robe. 2nd & 3rd bedrooms both have 2 single beds. The 2nd bathroom has toilet shower and vanity. The large lounge has CD player, TV and DVD player. Full kitchen with dishwasher, oven, stove, crockery, cutlery. Linen is supplied. A peaceful 2 bedroom side apartment with full kitchen and beautiful ocean views from your balcony. Apartment is facing the north for a warm and restful stay without roads between you and the Beach. Queen bed in the Master bedroom with En-suite. 2nd Bedroom has 2 single beds and bedrooms have views to the Mooloolah River. The 2nd bathroom has laundry facilities, toilet, shower and vanity. The lounge has DVD player, TV and FOXTEL. Full kitchen with dishwasher, oven, stove, crockery, cutlery. All linen is supplied. A peaceful 2 bedroom apartment with beautiful ocean views. Full kitchen & laundry facilities. Apartment has balcony facing the north for a warm and restful stay without roads between you and the Beach. Balcony looks to the Ocean. Queen bed in the Master bedroom with Ensuite. 2nd Bedroom has 2 single beds. The 2nd bathroom has toilet shower and vanity. The lounge has DVD player, TV and FOXTEL. Full kitchen with dishwasher, oven, stove, crockery, cutlery. All linen is supplied. A peaceful 2 bedroom centre apartment with beautiful ocean views through the full view windows (glassed in balcony). Full kitchen, laundry facilities. Apartment facing the north for a warm and restful stay without roads between you and the Beach. Queen bed in the Master bedroom with En-suite, 2nd Bedroom has 2 single beds. (In one case there is a Double Bed & Single Bed) The 2nd bathroom has toilet shower and vanity. The lounge has air conditioning, TV, DVD player, and FOXTEL. Full kitchen with dishwasher, oven, stove, crockery, cutlery. All linen is supplied. A peaceful 2 bedroom side apartment with full kitchen and beautiful ocean views from your balcony. Apartment is facing the north for a warm and restful stay without roads between you and the Beach. Queen bed in the Master bedroom with Ensuite. 2nd Bedroom has 2 single beds and bedrooms have views to the Mooloolah River. The 2nd bathroom has laundry facilities, toilet, shower and vanity. The lounge has DVD player, TV and FOXTEL. Full kitchen with dishwasher, oven, stove, crockery, cutlery. All linen is supplied. A peaceful 2 bedroom fully renovated superior side apartment with beautiful ocean views from the balcony. Apartment faces the north for a warm and restful stay without roads between you and the Beach. Has Queen bed in the Master bedroom with En-suite, 2nd Bedroom also has a Queen bed and both bedrooms have views to the Mooloolah River. The 2nd bathroom has laundry facilities, toilet, shower and vanity. The lounge has TV, DVD player, iPod docking station and FOXTEL. Full kitchen with dishwasher, oven, stove, crockery, cutlery. All linen is supplied. A fully renovated 2 bedroom centre apartment with beautiful ocean views through the full view windows (glassed in balcony). Apartment faces the north for a warm and restful stay without roads between you and the Beach. Queen bed in the Master bedroom with Ensuite. 2nd Bedroom has 1 double bed & 1 single bed. The 2nd bathroom has toilet shower and vanity. The lounge has air conditioning, DVD player, TV and FOXTEL (cable TV). Full kitchen with dishwasher, oven, stove, crockery, cutlery. All linen is supplied. A peaceful 2 bedroom centre apartment with beautiful ocean views through the full view windows (glassed in balcony). Full kitchen, laundry facilities. Apartment facing the north for a warm and restful stay without roads between you and the Beach. Queen bed in the Master bedroom with Ensuite, 2nd Bedroom has 2 single beds. (In one case there is a Double Bed & Single Bed) The 2nd bathroom has toilet shower and vanity. The lounge has air conditioning, TV, DVD and FOXTEL. Full kitchen with dishwasher, oven, stove, crockery, cutlery. All linen is supplied. A peaceful 2 bedroom fully renovated centre apartment with beautiful ocean views from the balcony. Full kitchen, and laundry facilities. Apartment faces the north for a warm and restful stay without roads between you and the Beach. Queen bed in the Master bedroom with TV & and En-suite, 2nd Bedroom has 1 Double bed & 1 single bed, also with TV. The 2nd bathroom has toilet shower and vanity. The lounge has air conditioning, DVD player, TV and FOXTEL. Full kitchen with dishwasher, oven, stove, crockery, cutlery. All linen is supplied. Spectacular Ocean and Hinterland views in this 4 or 5* bedroom apartment from the 10th floor. Full kitchen and laundry facilities. Lift goes to 9th floor, then a curved staircase ascends to the top level. Apartment has balcony facing north for a warm and restful stay without roads between you and the Beach. Queen bed in the Master bedroom with En-suite and Spa bath. 2nd Bedroom has a queen bed. 3rd & 4th bedrooms have 2 single beds each. The 2nd bathroom has toilet shower and vanity. The lounge has air conditioning, DVD player, TV and FOXTEL. Full kitchen with dishwasher, oven, stove, crockery, cutlery. All linen is supplied. The Optional Studio (* 9th floor) has a queen bed and its own balcony and en-suite. Studio at $130 to $150/day extra sleeps 2 (queen bed and coffee facilities only). Maximum occupancy is 10 (incl. studio). 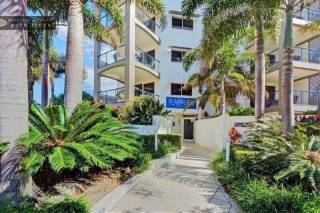 Enjoy the majestic views from 84 the Spit’s absolute Mooloolaba Beachfront location - DIRECT BEACH ACCESS with no roads to cross. 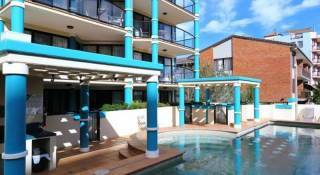 The 10 storey high rise is an icon situated on the exclusive Mooloolaba Spit. 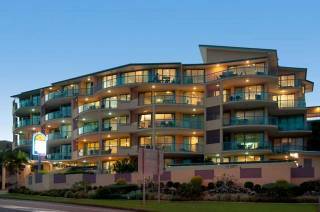 We are the only on-site managed high rise in Mooloolaba actually on the beach front with no roads to cross to the beach. 84’s large Beachfront Apartments are on the lower floors and the Ocean view apartments are from floors four to nine. All 84 the Spit’s spacious apartments are all fully self-contained with full kitchen and laundry facilities, including dishwasher, microwave, full-size fridge, washer and dryer, DVD player and FOXTEL. The beach, surf club, beachfront parks and playgrounds with barbecue facilities are all close to the resort. Additional attractions including Underwater World, the Wharf Complex, Wharf Tavern, the lively Esplanade restaurants, cafes & shops are a short stroll along the beach or boardwalk. Patrolled throughout the year, the naturally sheltered aspect of the beach provides exceptionally safe swimming conditions. More than just a memorable holiday, a stay at 84 on the spit in Mooloolaba is an outstanding experience. 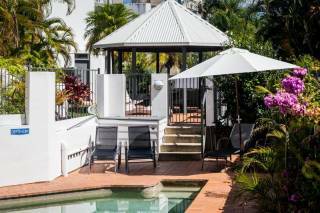 Mooloolaba on the Sunshine Coast is the perfect choice for your Queensland beach holiday. 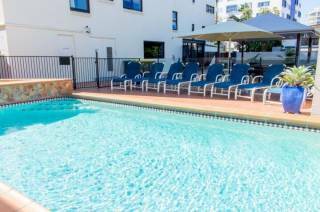 Mooloolaba experiences climatic conditions that are somewhere between the Mediterranean and sub-tropical. In other words, it means that even though it is warm throughout the year, seasonal variations are noticeable. January and February are months of peak summers and see temperatures rising to mid thirties. Then again, even though July and August are cool by local standards, temperatures generally still stay around the mid-twenties Celsius. This climate makes it perfect to rent holiday accommodation in Mooloolaba at any time of the year. The Surf Club and Cafes of the Mooloolaba Esplanade are a short 200m walk along the Boardwalk. Underwater World & the Wharf Complex of shops and restaurants are just a minute walk away. The Australia Zoo shuttle bus collects visitors at our front door. All tour tickets available through Reception incl. Fishing, Scuba diving, Whale Watching (in season), Eumundi Markets etc. 84 The Spit adopts the following practice when dealing with the booking and cancellation of a holiday booking. All bookings, regardless of how far in advance they are made, must be confirmed by a deposit at the time of booking. A deposit of $200 low season, $300 Mid & Shoulder seasons & $500 for high season is required to confirm the booking. Bookings exceeding 4 weeks require a deposit of not less than one week’s tariff. If the booking is cancelled 28 days or more prior to the planned date of arrival, there will be a full refund of deposit less an administration fee of $55.00. If the booking is cancelled less than 28 days prior to the planned arrival date, there will be no refund of deposit unless and until the apartment is re-let for the total period of the original booking. If re-let, an administration fee of $55.00 will be deducted from the deposit before the remainder is refunded. If the booking is cancelled less than 14 days prior to the planned arrival date, there will be no refund of deposit unless and until the apartment is re-let for the total period of the original booking. If re-let, an administration fee of $55.00 will be deducted from the deposit before the remainder is refunded. Where a booking is made less than 14 days prior to the planned arrival date, there will be no refund of deposit unless the apartment is re-let for the total period of the original booking. If re-let, an administration fee of $55.00 will be deducted from the deposit before the remainder is refunded. Follow the Esplanade past the Mooloolaba Surf Club and turn left into Parkyn Parade or if coming from Brisbane via the Sunshine Motorway, follow "UnderWater World" signs and turn right into Parkyn Parade from River Esplanade. We are just over the road from SEALIFE (UnderWater World) Only 15km from Sunshine Coast Airport and 110km from Brisbane Airport. Bus transfers are available from both airports. Just ask.